SavvySeekers - Online Survey Tips: How can you maximize your survey opportunities? How can you maximize your survey opportunities? If you enjoy taking surveys or want to earn some extra cash taking surveys, you likely want to take all of the surveys that you can. How can you increase your number of survey opportunities? Survey routers help you increase your chances of qualifying for surveys. Have you seen a survey router? A survey router is a program that checks for available surveys and offers any up to you. A survey router may come up at the beginning of a survey. If it does, it will ask you a few demographic questions to qualify you (usually age, gender and region) and will check to see if there are any available surveys looking for respondents with your demographics. If so, it will ask if you would like to take the survey. Sometimes after you take a short survey or are screened out of a survey, you will be asked if you'd like to take another survey. If you have the time, it's a great way to build up your rewards more quickly. Many legitimate market research companies have survey routers as part of their programs. Ipsos and HarrisPoll are two examples of companies with survey routers. Ipsos asks whether you would like to take another survey when you have been screened out of a survey. 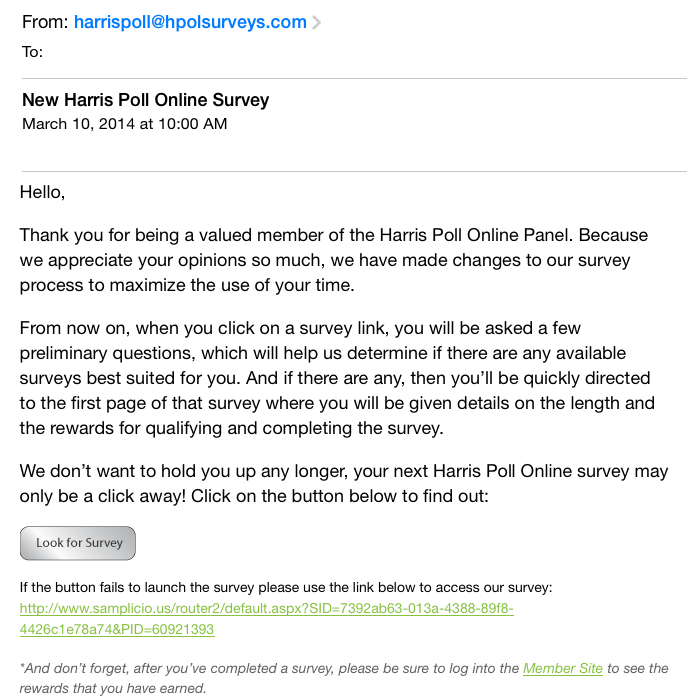 Harris Poll starts with a survey router each time, which means it goes through all available surveys to find one you qualify for. This gives you even more chances to build up your account quickly. Taking a survey through a survey router is pretty straightforward. You will be asked basic demographic questions (even if you just answered them to qualify for the earlier survey). This is a bit annoying, but it ensures that only qualified respondents are chosen. When it finds a survey for you, you will be asked if you'd like to take the survey and it should tell you how long it will take and what your reward will be. In some cases, the new survey may be from a partner. When you click to take the survey, you may be re-directed to a new site. But don't worry, the new partner will be credible just like the panel you joined. If you have been re-directed, you should end back on the original site. We suggest you keep track of the date, your reward, the partner site (if applicable) and any other details about the survey. This will help you check that you have been given your reward. You can join these great panels and others at SavvySeekers.com. Join legitimate surveys and start earning extra cash today!